MOORE, Okla. – Detectives are now investigating a family’s claim that their father was beaten to death by several Moore Police officers around midnight Saturday, reports CBS affiliate KWTV. Nair Rodriguez told KWTV that incident started after she slapped her daughter Lunahi Rodriguez at the Warren Theater in Moore, Okla. early Saturday morning and then stormed away. Her husband, Luis Rodriguez, then chased after her into the theater’s parking lot, where he was confronted by police asking to see his information, the family said. Nair and Lunahi said Luis tried to bypass the officers and stop his wife before she drove away in anger. That’s when the officers took him down and started beating him, according to the family. Lunahi Rodriguez said her father was beaten to death by five Moore police officers in the movie theater parking lot. “When they flipped him over you could see all the blood on his face… he was disfigured, you couldn’t recognize him,” Lunahi said. Nair Rodriguez said she recorded the beating with her cell phone, which police confiscated. “I saw him. His [motionless] body when people carry it to the stretcher… I knew that he was dead,” Nair told KWTV. Nair said that her husband’s only intention was to break up the fight between herself and her daughter. “I told [police] I hit her and he was just trying to reach me. Why didn’t they arrest me?” she said. 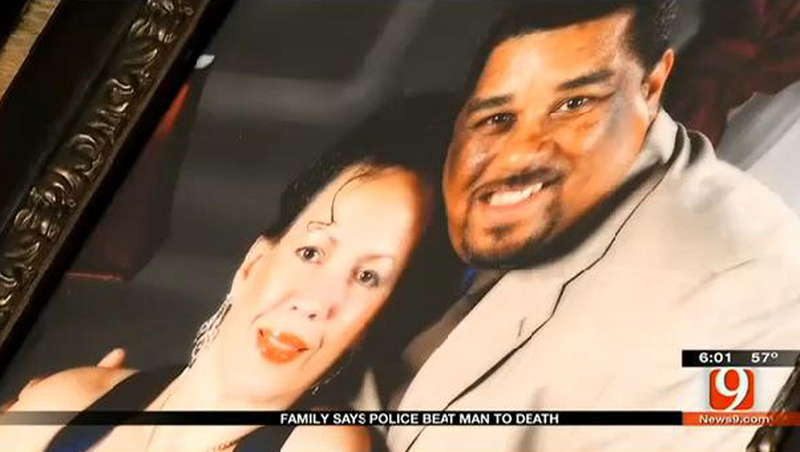 Luis Rodriguez was taken to the hospital and later pronounced dead. Three Moore Police officers have been put on administrative leave in connection with the incident. Detectives are investigating. The family told WKTV that they intend to hire an attorney.